Canada’s new food guide, released on January 22, is causing a splash. The authors refused to use any industry-backed studies and the result is a guide that differs dramatically from past ones. The 62-page document urges Canadians to adopt a mostly plant-based diet, to drink water instead of milk, and to worry less about daily servings of nutrients and specific portion sizes and more about cooking meals at home and eating with family and friends. The food guide is divided into four sections. The first focuses on nutritious foods and what comprises a healthy diet. This is where the emphasis on proportion, rather than portion, is most evident. 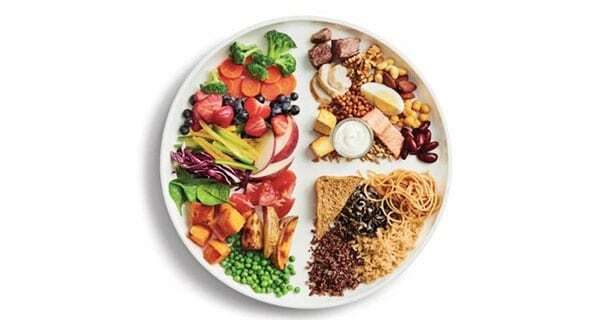 The guide contains an image (above) of a dinner plate half-covered in vegetables, with quarter-sized servings of protein foods (nuts, chickpeas, tofu, beef, salmon) and mixed whole grains (toast, wild rice, quinoa). The second part of the guide addresses foods that should be minimised or avoided. These include sugary drinks and confectioneries, alcohol, excess sodium, and sources of saturated fat. The third section is perhaps most interesting, as it encourages Canadians to think about how they eat. The guide states, “Healthy eating is more than the foods you eat,” and this section is dedicated to sharpening one’s food skills and improving one’s food literacy. Canadians are advised to cook from scratch more often, to go to restaurants less frequently, and to eat together. Parents are urged to transfer food skills to their children by example and through changes to school curricula. The guide advises a mindful approach to eating, careful reading of labels, skepticism about food marketing, and an effort to reduce waste. The fourth and final section talks about implementation and how to make healthy eating accessible and available to all Canadians. This is an ongoing challenge for many low-income and Indigenous families, and, as André Picard writes for the Globe and Mail, affects one in six Canadian children. Find the whole guide and other resources here.